Tokwa’t Baboy is a popular side dish / appetizer in the Philippines where the main ingredient are tofu and pork’s ears (Yes you read it right pork ears). Tofu as most of us know is made out of coagulated soy milk then pressed, a very popular ingredient in Chinese cuisines as well as other Southeast Asian countries. It comes in many forms that vary in firmness and smell. Tofu on its own does not have a strong taste that why most of the dishes that this is used have strong flavoured sauce like this post where it is soaked in vinegar. This versatile ingredient originated in China during the Han Dynasty then due to Buddhism it spread really fast in South East Asia due to the fact that this is one of a major protein source for the vegetarian diet. A very healthy alternative to protein which contains almost no fat, low in calories but high in iron. Now for this dish, as I have mentioned it is a popular appetizer and usually it is commonly served as a beer match, it is also served with different types of congee like arrozcaldo and goto. If you like sour dishes you will definitely like this but if you don’t like pork’s ears or it turns you off just by the thought of it you can also replace it with any pork meat with a good amount of fat and that’s the key as it adds to the different array of textures from different ingredients like the crunchiness of deep fried tofu, jelly like texture of the pork fat and the firm texture of the pork’s meat. So if you have cold beer in your fridge try to partner this one out and not the usual pizza slice for a change. Rub salt, pepper and sesame oil in pork ears then set aside for 30 minutes. Prepare a steamer and steam pork’s ears for 45 minutes or until, it becomes tender and sticky. Remove from steamer and cut into bite sized pieces. In a fryer, deep fry tofu until outer skin is golden brown and crispy. Remove from fryer let it cool then slice into cubes, set aside. Mix the vinegar, onions and soy sauce with ¼ cup water, sugar and freshly ground black pepper. Place chopped ears and tofu into a deep dish and pour vinegar mixture then topped with chopped chillies. I’ve never had pigs ears, been curious to try. I would try this. I’ve never had pig ears before. Hmmm. I would and have eaten pork belly. The ears though…that might be a tough one for me to get around. Then again, I suppose I am willing to try new things. Well, I have everything but the pig’s ears! Most interesting and shall most decidedly try!!! [Oh, yes, well, I have THIS butcher who keeps insisting there is not a body part he cannot access?]! 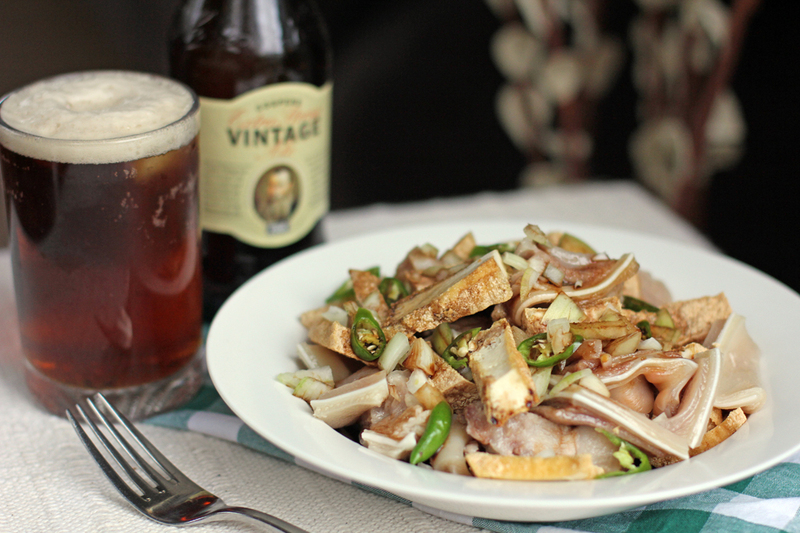 Tokwa’t baboy is the heart of a good night-out. I was looking at your photo and thinking “that looks like pig ear !” and then I started reading your post 🙂 My grandad (from Penang in Malaysia) would have loved this.